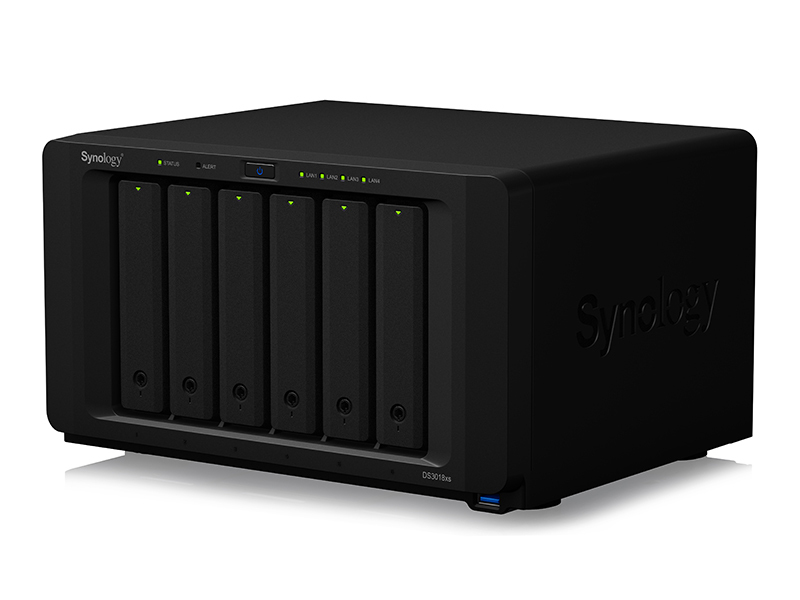 Synology is in the middle of a massive refresh of its NAS offerings as it announced five new NAS units. Some of the major pushes make sense given the market. We are seeing a trend toward 10GbE as well as M.2 NVMe SSDs for better performance. The flagship of the new offerings is the Synology DS3018xs, a 6-bay desktop offering. 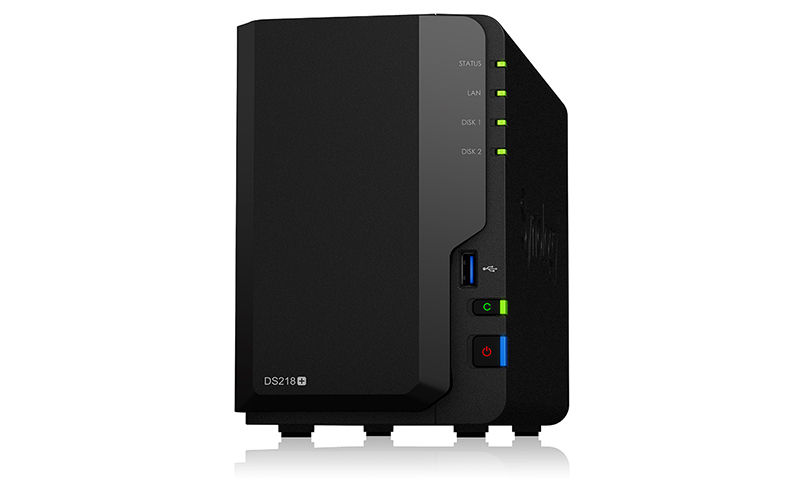 The Synology DiskStation DS3018xs features an Intel Pentium D1508 dual core four thread processor. STH benchmarked the Intel Pentium D1508 and found it to be a great platform. Synology is only using the 1GbE (has quad 1GbE total) from the Pentium D and is not using the 10GbE on package NIC. Instead, Synology has a 10GbE add-on card. The NAS unit also features a PCIe slot for expansion including using two M.2 SATA SSD’s via an adapter. You can also expand RAM of the unit up to 32GB which is important as Synology has been positioning its units for lightweight virtualization usage. Synology also has a number of applications for its NAS units such as e-mail and video surveillance where you may want more RAM. 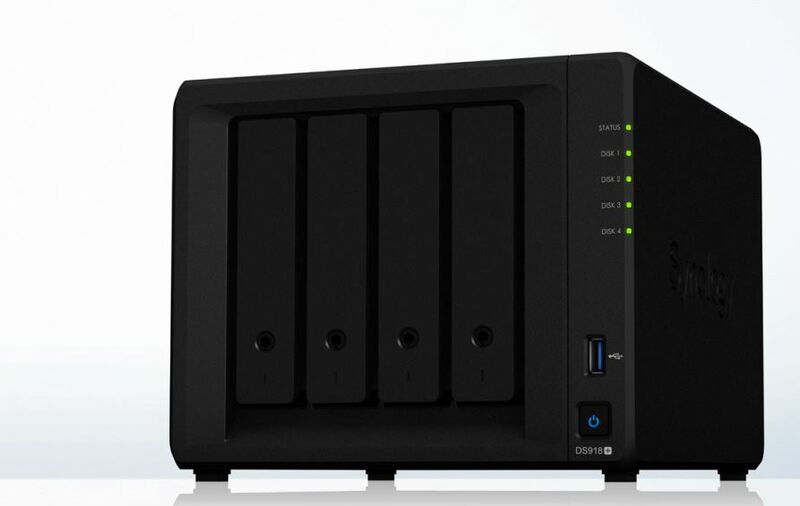 The Synology DiskStation DS918+ is a four-bay NAS unit that we will be reviewing on STH soon. It features an Intel Celeron J3455 quad-core 1.5GHz (2.3GHz Turbo) CPU, dual 1GbE, 4GB RAM (8GB max), and an array of USB ports. Perhaps the standout feature is the ability to use dual m.2 2280 NVMe SSDs. More on this one soon from STH. 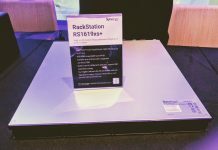 Like the DS918+, the Synology DiskStation DS718+ is powered by the same Intel Celeron J3455 quad-core CPU and has two 1GbE ports. The dual-bay DS718+ has 2GB of RAM standard and can scale up to 6GB RAM. 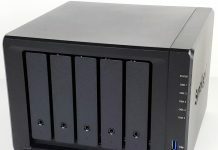 Synology has two new highly cost optimized NAS units. The first is the Synology DiskStation DS418 which is a 4-bay NAS. Instead of a standard Intel CPU on the plus (+) models, the DS418 uses a quad-core Realtek RTD1296 at 1.4GHz. It has 2GB of RAM. The Synology DS218+ is a 2-bay NAS featuring the Intel Celeron J3355 dual-core 2.0 GHz CPU with AES-NI. This NAS unit is a lower-cost option with 2GB of RAM expandable to 6GB. It also has a single 1GbE port as it is optimized for cost. Both options provide basic entry-level NAS options that run the great Synology software packages. The benefits one gets with these units is a low cost of entry into the Synology ecosystem. Good afternoon. I would love to see a review of the DS218+ as my current NAS is past retirement age. One thing I want my new NAS to have is photo management software, especially with facial recognition. 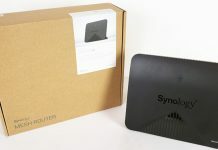 I believe the Synology software offers that but I’ve heard mixed reviews on how well it actually works. It would be great if you reviewed that, and any other unique features of Synology’s environment on the model being reviewed. Thanks. Only when you buy Synology you realize how limited their OS is, even compared to simple setup you can get with freeNAS or say Windows Server/SMB. Is really pain to get even the simplest things to work and they will never do. You hit limit afer limit after limit. Try to setup whole disk encryption. Like Bitlocker. You can’t. To hack synology is one ease for anyone due to the way the encryption works and how it stores password. Second, try to setup offline files synchronization. That’s first class citizen in Windows. Few clicks to do to map your required folders to SMB shares. Which are of course encrypted. Pain in Synology DSM OS. Third, they are using very outdated linux kernels. Like very. I’m not speaking Android 3.18 old, or routers 3.10 ancient. I mean freaking dinnosaur old. So much for the underlying features. Hardware is nice, but for software, please look somehere else. This is not a rant. Just a customer that invested a lot into the infrastructure and realised later how limited it is even compared to basic solution a kid can build using other technologies (windows server/freeNAS).